As if Oregon Craft Beer Month didn't give me enough to do, I decided to enjoy a self-imposed Imperial Birthday Beer Week: on each of the seven days surrounding my birthday, I sought out an Oregon brewed imperial beer. I didn't give much preparation to the challenge, I just woke up Sunday and decided to give it a try. How hard would it be to find (and drink) one imperial beer each day for a week? Well, it turns out that the difficulty was in only drinking seven. By the end of the week, I had worked my way through tasting 16 different imperial beers. The proverbial feather in the cap of this week was Concordia Ale House's Concordia Cup, featuring twelve different Oregon Imperial IPAs. This obviously helped me put a dent in my goal for the week. The only drawback to this type of event is palate fatigue. Imperial IPAs are a palate destroyer and while it is a fun event, after twelve 3 ounce samples, it's very hard to pick a clear standout. The first few can be distinct, but then it's just an enjoyable assault of bitterness and alcohol. Other highlights included Widmer's Bourbon Barrel KGB Russian Imperial Stout. If you think the name is a mouthful, try the beer. I've been waiting for this beer to be re-released for about six years, and it did not disappoint. This beer also made a short appearance at the Buzz Beer tent at the Oregon Brewers Festival this year. Rob and Kurt: please don't make me wait another six years! The Green Mammoth is a great experience and the Ace of Spades is always a welcome release. Wait a minute, my whole week was a highlight, so maybe it's just better to give you a list. The point is, in Portland, event when you make up your own beer events, they can exceed your expectations. Sunday: Laurelwood Brewing's Green Mammoth (IBU: 68, Plato: 16, ABV: 6.9%) "The Green Elephant is big, strong, and green- organic that is. A relative of the American IPA, the Green Elephant takes big hop flavor to the next level. Brewed with 100% organic malt, Cascade, Amarillo and Ahtanum hops, this is a unique and beautiful creature. The Green Elephant's smooth and subtle malt character gives way to a bold, aggressive hop flavor. But be warned, this is one elephant that can sneak up on you." Tuesday: Deschutes Brewery's Black Butte XXII (ABV: 6.9%) "First brewed to celebrate our 20th anniversary, our extreme cousin of Black Butte Porter is back for a third performance in 2010. Generation XXII melds cocoa nibs, dark chocolate, orange peel, and chilies all aged in bourbon barrels to create a masterpiece of creative brewer whimsy." and Hopworks Ace of Spaces Imperial IPA (IBU: 100, Plato: 21.5, ABV: 9.2%) "This hopped out beast had Amarillo, Cascade and Centennial hops, added at every point; mash tun, first wort, kettle, and dry hop. All the green goodness results in a beer with a huge citrus hop aroma, flavor and deep clean bitterness." Thursday: Lompoc Brewing's C-Note Imperial Pale Ale (IBU: 100, ABV: 6.9%) "Centennial, Crystal, Cascade, Cluster, Chinook, and Columbus make this double IPA a hophead's dream." Friday: Deschutes Brewery's 2009 Abyss "The Abyss has immeasurable depth inviting you to explore and discover its rich, complex profile. Hints of molasses, licorice and other alluring flavors draw you in further and further with each sip. And at 11% alcohol by volume, you will want to slowly savor each and every ounce." Saturday: Widmer Brother's Deadlift Imperial IPA (IBU: 70, ABV: 8.6%) "It has the strong hop flavor you'd expect from an Imperial IPA, but no heaviness that could weigh down your desire to take another sip. 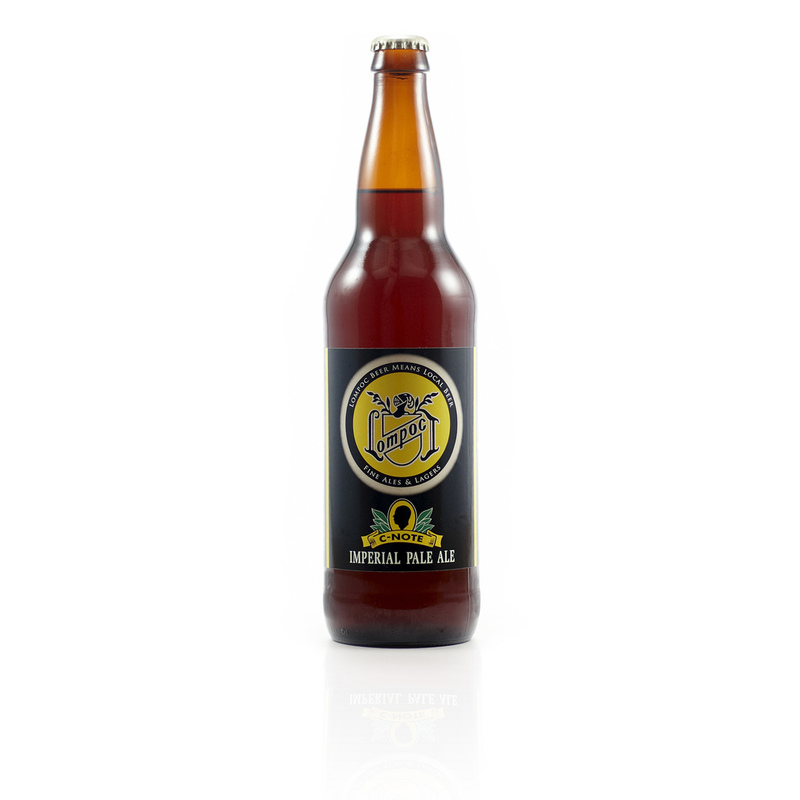 The unique flavor stems in part from the Nelson Sauvin hops imported from New Zealand. These hops have an intense citrus, berry like aroma and flavor not found in any other variety. Deadlift's simple but fully braced malt backbone muscles up enough malty sweetness and caramel character to spot the incredibly robust hop aroma and flavor."